The latest issue of UK indie title Paragon, Issue 5, edited by Dave Candlish is out now. 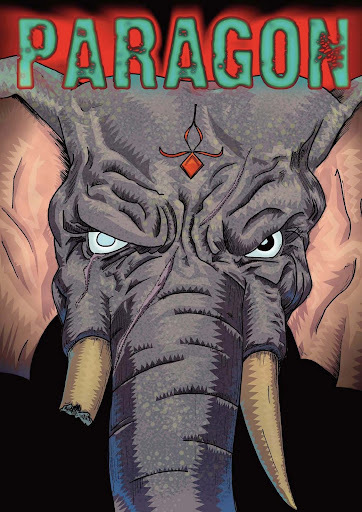 Featuring the work of artist Stephen Prestwood and writers Dave Candlish (who also provies some art) and The Emperor, with additional contributions from Steven Denton, it's not quite got the variety of Paragon 4 but it still has the energy and exuberance of past issues. Highlights for me are the ongoing modern re-telling of Hindi legend, Battle Ganesh, and an "Oor Wullie" parody featuring the same character. The Emperor's slick scripting on the main Battle Ganesh story for the issue kicks the proverbial out of the interminable version of the Hanuman myth I recently had to read as part of my day job formatting Indian comics for mobile. As ever with anthologies, some strips miss the spot for me, let down by disappointing art - although the writing throughout has plenty of promise. One strip that definitely caught my eye was "Julian Ruby", an intriguing tale that has plenty of promise, although for an irregular magazine it could perhaps have moved along a little faster - but there's lots set up for next issue, so we'll see how this one pans out. Paragon again has the same rough edges I mentioned last time, but it's well worth tracking down for the Battle Ganesh story alone. This is British small press well worth your support. Dan Dare Revived - in Bosnia! 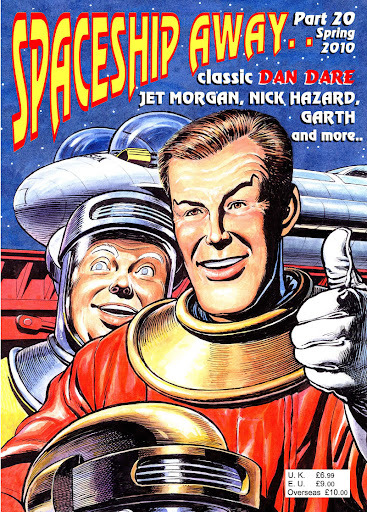 Dan Dare is back in a regular comic - in Bosnia and Herzegovina. After a long time off the shelves, publishing company PrintMedia has just relaunched Plavi Vjesnik, which first published the Eagle space hero (and other Eagle strips) in the 1950s. Plavi Vjesnik (which publisher Ivo Milicevic tells us translates as "Blue Herald") was first published between 1954 and 1973 by publisher Vjesnik, and was has been revived sporadically since the early 1990’s. 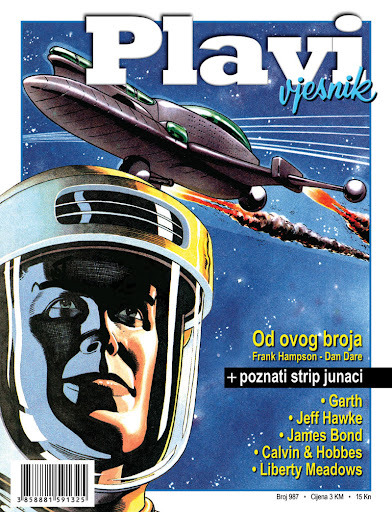 Plavi Vjesnik was the first Yugoslavian comic to contain Dan Dare reprints (or Den Deri, Pilot Buducnosti, as he was known), although other titles, such as EKS Almanah, Panorama and ZOV would bring the strip to all parts of the former Yugoslavia. The new magazine also features reprints of Jeff Hawke, Garth and James Bond alongside humour strips Calvin and Hobbes and Frank Cho's racy Liberty Meadows. This new venture joins PrintMedia's other titles, Strip Magazin - which has just passed its landmark 50th issue - and a Bosnian edition of Metal Hurlant (Heavy Metal). The latest issue of Spaceship Away, the science fiction comics magazine inspired by and featuring the original Dan Dare has just gone to the printers and will be on sale in all its usual outlets, and online, soon. This issue, with a superb cover from veteran Dan Dare artist Don Harley, continues two ongoing Dan Dare stories, "Green Nemesis" by Rod Barzilay and Tim Booth, and "The Gates of Eden" by Tim alone, a brand new Dare adventure strip, set a year and a half before “The Red Moon Mystery”. "Garth: The Bubble Man" by Frank Bellamy, beautifully coloured by John Ridgway continues this issue, as does "Journey in Space: Planet of Fear" written by by Charles Chilton, and drawn by Ferdinando Tacconi. Also featured is the first part of "Homecoming", an Ex Astris story by John Freeman and Mike Nicoll. Feature wise, there's a report on the recent Spaceship Away day event and full information on Alistair Crompton's new book on Dan Dare creator Frank Hampson, Tomorrow Revisited, out later this year. Graham Bleathman providea a cutaway of Dan Dare's spaceship, the Anastasia, and there are some images of the original models used in the creation of the Dan Dare strip back in his original Eagle days, and an update on Day2Day Trading's new Dan Dare action figure which we've reported on here. • While we're on the subject of Dan Dare, comic fans may like to know he's invaded France... sort of. 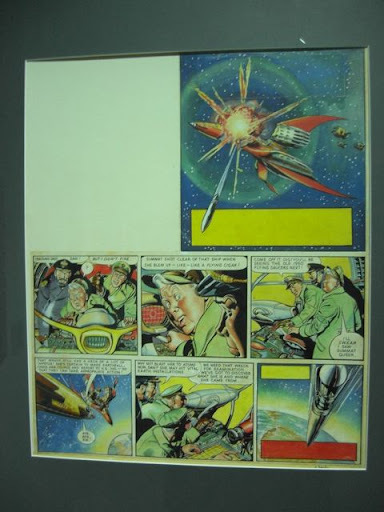 A page of "Dan Dare: The Man From Nowhere", first published in Eagle Volume 6, Issue 21, cover dated 27 May 1955 is currently n display at the Comics Museum in Angoulême. downthetubes readers Chris Weston and Sean Phillips helped out with the identification of the piece for the Museum after an appeal for info from Paul Gravett. Michael Rosen, Children’s Laureate 2007-2009, is heading the panel of judges in a new short story competition for children and young people just launched by children’s charity Jigsaw4u (www.jigsaw4u.org.uk). Entrants have the option of sending in an illustration. Launched in 1997 by chief executive Anne Davies, Jigsaw4u helps children, young people and their families cope with grief, loss, bereavement and trauma. Edward Davey MP, a patron of Jigsaw4u, is also among the panel of judges. The theme of the competition is “loss” and this can be interpreted in any way. It could be the loss of a favourite toy, the loss of a favourite pet, the impact of divorce or the loss of a relative. It is entirely up to them. The deadline for entry is 30 April, 2010 and there are three categories: 5-8 year olds (500 words), 9 to 13 year olds (800 words) and 14 to 18 year olds (1,500 words). They can send in an illustration to accompany the story – only one per entry. The winning story and the two highly recommended stories in each category will be published on the Jigsaw4u web site. All winners will receive a special certificate and the three first prizewinners will be invited on an all expenses trip to London (to be accompanied by a parent) to attend the prizewinning ceremony to be followed by lunch with Michael Rosen (overnight accommodation will be provided). The judging panel will comprise: Michael Rosen, Children’s Laureate 2007-2009; Anne Davies, chief executive, Jigsaw4u; a team of young people; Maggie Turner, chief executive of the Diana Award and Edward Davey, MP, a patron of the charity. DC Thomson, publishers of The Beano and award-winning teen title Shout, have announced their biggest girls’ magazine launch of 2010: the Official Jacqueline Wilson Magazine, based on the life and works of the popular and acclaimed children’s author and former staffer for the company. Jacqueline’s books have become synonymous with the best in children’s publishing: her honest and warm writing style, coupled with signature Nick Sharratt artwork, resonates so strongly that she has sold over 25 million books in the UK to date. Jacqueline’s history with DC Thomson stretches back to her first ever writing job: she began her career as a young journalist on the iconic Jackie magazine. “I've often talked about my time as a very junior journalist with DC Thomson in the 1960s," Jacqueline says, "but I never dreamt that I would be connected to the company again in such delightful circumstances. With the tagline For Girls Who Love Reading!, the magazine offers something new to a celebrity-saturated tween girls’ market. While there doesn't appear to be any comic strip from the press material, the first issue does feature an exclusive story and writing tips by Jacky and drawing fun with Nick Sharratt. Each issue will include a pull-out about one of Jacky’s best-loved books, plus quizzes, crafts and games. The launch covermount is an exclusive sampler from Wilson’s new book, Little Darlings (published 4th March), plus a My Story Notes notebook and pen. A new website, www.jw-mag.com, takes the magazine experience beyond the last page. On launch, it will contain information about each issue, discussion posts, puzzles, and an application to create your own stories. • The Official Jacqueline Wilson Magazine will be available from supermarkets and independent retailers throughout the UK from 17th February 2010. In case it has passed your notice, Commando have been having a mini celebration of Ian Kennedy's work for the title as it is 40 years since he first produced a cover for them. As we have previously reported, the last batch of Commandos included a reprint of the issue that had that first cover, Seek And Strike, with its image of a German Stuka dive bomber beginning its attack on an allied aircraft carrier in the Mediterranean. Also included in that batch of Commandos was the Vietnam war story Cougar Squadron for which Kennedy produced not just the wraparound cover but also the internal artwork as well. While he did internal artwork for many of the IPC picture libraries in the 1960s, Ian Kennedy has only ever done the internal art of five different Commandos. Of those five, the current batch of Commandos on sale now includes the World War II based Jack's Private War (the third time this particular story has been published in Commando) and the Korean war based Fury Strike. Effectively these are as close to Ian Kennedy graphic novels as it is possible to get today. The only publication other than digests that we can think of that could be considered a Kennedy graphic novel is issue 16 of DC Thomson's Red Dagger from almost 30 years ago which reprinted his Tiger McTaggart stories from Wizard in one 64 page A4 magazine behind a typically excellent painted Kennedy cover. If DC Thomson were ever to start releasing graphic novels of reprinting stories from their many comics, we would certainly expect to see Ian Kennedy's work amongst them. The covers painted by Ian Kennedy for the four Commandos mentioned above are all available as wallpapers on the official CommandoMag website. Seek And Strike and Cougar Squadron are here, while Jack's Private War and Fury Strike are here. Quickly following up from the hugely successful launch of the Wallace & Gromit digital comics, Britain's Titan Publishing is now bringing another Aardman creation, Shaun the Sheep, to the iPhone. Shaun, the star of the hit BBC animated show, is a sheep who doesn’t follow the flock – in fact, he leads them into all sort of scrapes and scraps, turning peace in the valley into mayhem in the meadow. Shaun and his pals run rings around their poor sheepdog Bitzer, as he tries to stop the Farmer finding out what’s going on behind his back. The first Shaun the Sheep mobile comic release is available now on iPhone for free, featuring two classic tales adapted from Titan Shaun the Sheep comic: "Dinner Winners" - in which the Farmer is looking forward to his Christmas Dinner so much he forgets to feed Shaun and his friends, a mistake that costs him dear! - and "Snow Joke", a story which sees what happens when the pigs just don’t know when to quit when a snowball fight goes too far. Bitzer gets some payback on the porky pests! The first Wallace & Gromit Comic has been downloaded over half a million times since it launched in November, and was the number one free book app in the UK, US, Canada, Australia, New Zealand -- and Finland! “A splinter of metal is lodged in your heart. If it moves, you will die." These words struck Flight-Lieutenant Jack Hammond like a hammer blow. His immediate thought was to lie still, keep quiet, not move. But then he reasoned — if I’ve got to go, I might as well go out fighting! It was then that Jack declared his own private war on the Nazis — and he didn’t care whether he survived it or not. "Ken Gentry was, I think, based in South Africa," notes Commando editor Calum Laird, "which in the days of snail mail made the delivery of one of his scripts a long drawn-out process, especially if there were changes need to the synopsis." When the Germans bulldozed their way into France in 1940, it re-awakened memories of the First World War. In one case it also re-awakened a vast cache of explosives left forgotten in that country. A terrifying reminder of what had happened 25 years before. And for one soldier, Lieutenant Johnny Stafford of the Royal Engineers, this was only the first blast from the past this war would bring. In June 1940, the RAF battled in the skies of over Britain to turn back armadas of German bombers and fighters launched against them. The fighting was desperate and deadly. But this wasn’t the first time that British airmen had done battle in those same skies. Years earlier, airborne attackers had streamed across from Europe to attack. And just as in 1940, it was up to a handful of brave men to turn them back. downthetubes may have one of the best Scottish comics correspondents in, er, Scotland, in the form of Jeremy Briggs, but we don't have a foreign correspondent: and yet, British comic creators regularly attend the biggest annual French Comics Festival, Angoulême (an event which draws in double the number of people who attend San Diego), which seems remiss. Earlier today, I posted my drawings and comics from the Angoulême festival, and here are some photos I took while we were in western France. I'd never been to the festival of bande-dessinée before, so I went with Ellen Lindner and Stephen Betts (the latter one of the people behind comics translation site, Comixinflux), to see what it was all about. Angoulême is simply amazing. The whole town takes part in the festival and for a few days, everything is about comics. Almost every shop proudly displays bande-dessinée in their windows: for example, comics commentator Bart Beaty from The Comics Reporter took us into the local Quick burger joint to see the remarkable wall designs by... oh dang, I had it written down, a well-known French BD artist (Can anyone tell us who it is?). In fact, lots of wall murals peeking around corners, street art complementing no less than three amazing buildings across the river from each other, all housing comics exhibitions and libraries. I loved the reflections on this one, le Bâtiment Castro. Different comic artists have made tiles in the past, displayed outside, showing their characters. (Most were Franco-Belgian or American, but Ellen and I spotted one by Posy Simmonds). Inside, I was hugely impressed by the Museum of BD's permanent collection. I did my best to read some of the panels in French, but fortunately mon ami d'Internet w_o_o_d knew loads about BD and gave me a great tour of both the permanent collection. Then we went through to the neighbouring exhibition, Cent Pour Cent, in which a hundred comic artists reinterpreted a page of another comic artist's work. It was pretty amazing, even to someone like me who's only really starting to learn about comics' history. I ran into Patrice Aggs, who was thrilled to see an old Popeye film she'd unsuccessfully been trying to find on DVD for years. As we were going down the hill to the Castro Building with Paul Gravett and he stopped Jochen Gerner coming the other way. We went on to see his exhibition and for some reason I took more photos of that one than anywhere else. I liked his work: it was thoughtful and playful at the same time and a lot of the images were very simple and striking. This poster has a lot of comic artist names on it that I know and many I still need to look up. You can read some of this piece, Grand Vitesse online: it's a record of a train journey, with scenery sketches that get more and more streamlined as the train picks up speed. A lot of people come to Angoulême to meet their favourite authors and often stand in queues for hours to get dédications in their books. I was tempted to queue for Sémpe's album of New Yorker drawings, but I ended up buying three books from German author Mawil, having become a fan from his book We Can Still be Friends, published in the UK by Blank Slate. I did go to an hour-long talk by Sempé, illustrator of the much-loved Petit Nicolas books, and I only understood maybe a third of the French, but it was still great to see his drawings of New York and see what he was like. After he got very politely told he couldn't smoke in the hall, he spent much of the time making everyone laugh by teasing his two interviewers. The older interviewer seemed to be a friend of his, but he hardly talked to him except to rib him about his beard. Obviously a guy who's had a long, successful career and doesn't have to prove anything, but still fun to watch. In an exhibition of Russian comics, I was most impressed by Roma Sokolov's story, Kvas, drawn in felt-tipped markers. Many of the pieces were very nostalgic, for the Russian space age, old-time scenes like the elderly people queuing at the kvas truck, and Soviet-style packaging. The festival also gave a lot of space to up-and-coming young comics artists, and their work was hugely impressive, better than most adult British comics artists. Which makes sense, since French-speaking children are allowed to stick with comics throughout their whole lives instead of the majority feeling they have to give them up when they're able to read books without pictures. I hope we get more kids in Britain making comics, these French kids are really pushing themselves. As well as the comics on offer, we ate well: here's the gang on our second night. You can spot John Aggs, his mum Patrice, and David O'Connell, and then Nick Abadzis peering intently at a fabulous cheese trolley!< There was so much going on at the festival that I missed lots of things, such as the talks by Joe Sacco, Emmanuel Guibert and Robert Crumb, or see Baru (Hervé Barulea) win the Festival's Grand Prix, meaning he will be the president at next year’s festival. But I think I saw as much as I could possibly manage, and learned a lot. Thanks, Ellen and Stephen, for taking me along with you and showing me the ropes! I'm really looking forward to this festival next year, when I'll be selling my Vern and Lettuce book! • Read Sarah McIntyre's full Angoulême report and take a look at her many drawings inspired by the trip here. "The Angoulême Festival’s purple patch continues with Blutch’s turn in the presidential hotseat. A plethora of quality exhibitions ensure that 2010 will be remembered as a festival of the highest calibre." The Scottish HiEx comic convention has just announced several guests for its next event in March 2010. Taking place at Eden Court Inverness (27th and 28th of March), the convention - very much a family event - will feature a number of exciting new events over the course of the weekend, including plenty that will appeal to young children and families. A Kids Corner, where members of the DFC Library team will be on hand, is just one such item, an event marking the impending launch of three collections from the much-missd subscription-only weekly, The DFC. Each book showcases a single strip from The DFC, starting in March with Good Dog, Bad Dog by Dave Shelton, who is a Hi-Ex guest. Dave describes it as "a knockabout comic noir adventure comedy full of slapstick humour, terrible puns and exciting action"! (Good Dog, Bad Dog is followed by MeZolith in April from master storyteller Ben Haggarty and artist Adam Brockbank and The Spider Moon in May by Kate Brown). Sarah McIntyre , author of Morris the Mankiest Monster, will also be on hand to help the younger (and older!) visitors who fancy trying their hand at creating their own monster. And as if this wasn’t enough, this year sees the welcome return of Kev F Sutherland and his famous comic masterclass, with help from funding from the Highland Council. Plus, as an added bonus this year, Kev will also be putting on a performance of the hilarious Scottish Falsetto Sock Puppet Theatre. At the end of 1994 Alex Ronald, who's also a member of the downthetubes forum, wrote and drew Red Sands, his first comic, with the intention of getting noticed by 2000AD. One year later, he was a regular artist for the comic, including drawing Judge Dredd for the weekly title. For the last ten years Alex, whose career includes work as a storyboard artist for TV projects at Axis and Absolute Digital Pictures, has been working in CG, designing 3D characters and environment models for TV commercials and video games. Most recently, he's been painting magazine covers and promotional art for Dundee-based Ruffian Games in Dundee as well as concept art for indy film studios Black Camel Pictures and Mothcatcher Films. "Since last year I've been veering back toward illustration having landed concept art commissions," he says. "I've been bitten by the drawing bug again and plan to try comics again next year in a small press way. Checking out what other like minded folk are up to and hoping their enthusiasm will keep my batteries charged." 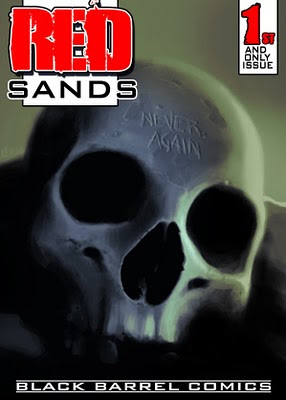 Now, Alex' Red Sands has been posted online as a free-to-view comic over at http://StarscapeOnline.com, an enthralling tale of colonists, tyrants and anti-heroes set in a futuristic 'gold rush'. 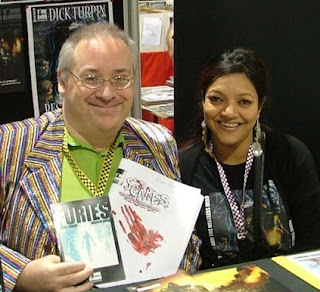 "Alex has kindly let me put Red Sands on the website," Starscape publisher Chris Smillie told downthetubes. "It's free to view online, download or, if you want the printed copy, there's a cheap version (£1.49) to buy too." The latest issue of the A5 size monthly Book and Magazine Collector is now in the shops with two British comics creators being covered. The magazine includes an interview with artist and writer Garen Ewing on his work on The Rainbow Orchid. Interestingly the six page interview is presented in the magazine's New Collectables slot which must bode well for how the magazine sees copies of Garen's title appreciating in the future. Garen mentions the interview on his own blog on The Rainbow Orchid website. The long running series of articles on Great British Comics Artists by David Ashford and Norman Wright has reached part 33. This issue's subject is Fred Holmes who worked on such strips as the highwayman Claude Duval in Comet in the 1950s, Roy Of The Rovers in Tiger in the 1960s and Carson's Cubs in Lion in the 1970s. Holmes worked on many of the digest comics in the 1960s including Tiger Sports Library and the Cowboy, War and Battle Picture Libraries. He retired in the mid 1970s with Dredger in Action being amongst his last work. A reminder that Norman Wright and David Ashford's book collecting 14 of the Great British Comics Artists series from previous issue of Book and Magazine Collector, Masters Of Fun And Thrills, is still available directly from Norman. 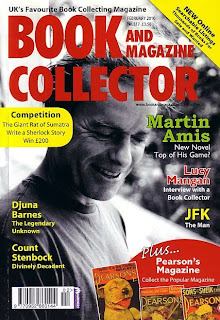 Book and Magazine Collector issue 317 is available for £3.50 from WH Smiths and Easons, or from the B&MC website. As much as we would like to tell you that DC Thomson have published issue 282 of their science fiction digest Starblazer, we can't. 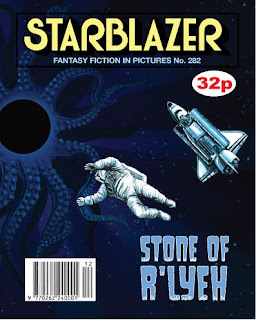 However we can show you artist Graeme Neil Reid's idea of what the cover of Starblazer issue 282 might have looked like. Graeme has posted the details of the artwork and his memories of Starblazer on his own blog where he also includes the full version of the illustration since Starblazer covers, like Commando covers today, wrapped around onto the back of the issue. He also includes an illustration of the pencils that he used to create the final version of the art. The pencil version of the artwork is now available to win on the Scotch Corner art blog. Graeme is offering the original pencils, an A3 print of the finished artwork and several original copies of Starblazer itself as the prize for the February competition on Scotch Corner. To enter the competition you simply have to go to the Scotch Corner blog and leave a comment about the prize in the competition section. What could be simpler? Colonel Sir Harold Wilberforce Clifton, former RAF pilot, former British spy, current Scout leader and not a grumpy person, as he would rather grumpily tell you, first appeared in the Begian edition of Tintin magazine in 1959 with the same story appearing in the French edition of Tintin in 1960. 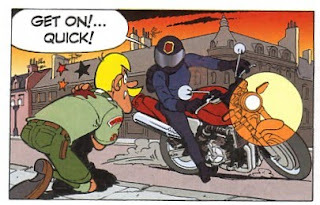 Created by Raymond Macherot, Clifton appeared in three stories in Tintin before Macherot jumped ship to Spirou magazine, leaving the Colonel behind in obscurity for the rest on the 1960s. The character was revived at the end of the Sixties and was written by Bob de Groot and illustrated by Philippe Liégeois (Turk) during the 1970s and the early 80s before Bernard Dumont (Bedu) took over first the art and then also the writing chores. The Bedu Cliftons ended in 1995 and the it would be 2003 before de Groot returned to the character with artist Michel Rodrigue. The first of these new Cliftons was entitled Jade. Colonel Clifton lives in retirement from his life as a spy for Her Majesty's Secret Service in the town of Puddington where he is the local scout master. Based on map coordinates which were mysteriously left in his post, Clifton changes the location of his Scout troop's camp from Wales to Devon so that he can investigate. 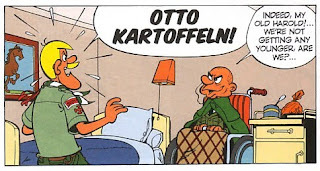 There, he is contacted by his old enemy Otto Kartoffeln while they are both unknowingly being watched by the British secret agent Jade. Kartoffeln's men attempt to kill Clifton but Jade rescues him on her motorbike. Leaving the scouts in Devon, the two travel to Scotland on the trail of Nazi gold in a sunken World War II U-boat. With his open top 1950s MG sports car and WWII vintage CMP lorry, both lovingly detailed in Rodrigue's artwork, as well as his blond handlebar moustache, Clifton certain cuts an unusual figure - but then, this is Britain as the Europeans see us. de Groot has fun with our place names with the sleepy hamlet of Snooze-On-Pillow in 'Devonshire' while Scotland provides the setting for the village of Haggish and the town of Hapyness, no doubt somewhere along the River Ness if not near Loch Ness itself. Mind you it is not just British place names. Clifton's German enemy Otto Kartoffeln's surname is German for potatoes and Kartoffeln is a nickname used by Italians to refer to Germans much in the same way that the British would use the word Kraut (as in sauerkraut). For all that it is mainly aimed at children this is a pretty violent tale. 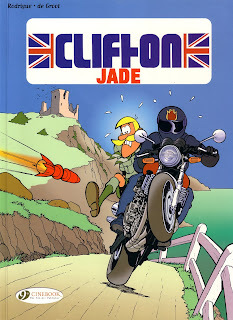 Clifton is shot at with guns, and even a rocket propelled grenade, hence the cover illustration, is almost blown up by a bomb and comes off worst in hand to hand combat with Jade herself. Yet it is all told at such a breathless pace that there is no time to dwell on just now many times Clifton is almost killed. This is very much a James Bond story for children with guns, explosions, different locations, different vehicles and a boo-hiss villain. It even finishes in a scene that is reminiscent of the final scenes of the Bond film Die Another Day that was out just before the book was published. With de Groot's script being both fun and action packed and Rodrigue's art being as humorous or as accurate as the panel requires, Jade is a Clifton book that sits comfortably between the needs of children to have an exciting story and adults to have something a little more knowing. It certainly makes me want to read the other de Groot and Rodrigue Clifton book published by Cinebook, Black Moon. There are more details of all the English language Clifton books at the Cinebook website. 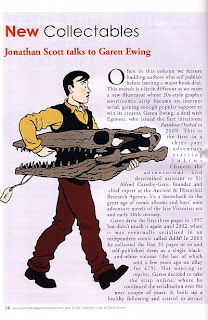 There are more details of the original French Clifton series in Tintin magazine at BD Oubliees website (in French). Considering how much of Jade is set in Scotland it seems very appropriate that Clifton artist Michel Rodrigue will be giving a free talk entitled "Drawing For Comics" at Blackwell's Bookshop on South Bridge in Edinburgh on Saturday 6 February 2010 and will also be appearing at the Hi-Ex comics convention in Inverness on 27 and 28 March 2010. More details of his Edinburgh appearance are on the Cinebook website while details of Hi-Ex are on the convention website. Congratulations from all here at downthetubes go out to Steve and Suzanne Tanner of Time Bomb comics on the arrival of their very own little bomblette. Sasha Joyce Tanner was born in the early hours of 31st January and weighed in at 6.8lbs. New dad Steve reports, "She is fit and healthy, her mother is tired and happy, her father is overawed and gobsmacked. " Suzanne had been showing off her baby bump at the Thought Bubble comics convention last November so with baby Sasha at least used to the noises of a comics convention we are wondering when she will be putting in her first public appearance at one. Could she be the youngest attendee at Hi-Ex in less than two months time? Marking the upcoming auction of BBC Doctor Who memorabilia at the world-famous auction house later this month (24th February), the latest issue of Bonhams Magazine (Issue 21) features an engaging feature on the series by Benjamin Cook, alongside the publication's more regular fare of articles on antiques and art. Titled "Who's in Town", the feature includes interview material with actors such as Peter Davison, citing the Cybermen as his favourite monsters, and other commentary on the show from Tom Baker, William Hartnell's widow, Heather and more, together with a fine selection of BBC publicity photographs of the show's many era. • The actual lots available in the auction have yet to be announced. The event details are here on the Bonhams web site, and the auction itself will be promoted via www.bonhams.com/drwho.